This switched wall light in antique brass finish with rectangular white fabric shade is stylish and classic. 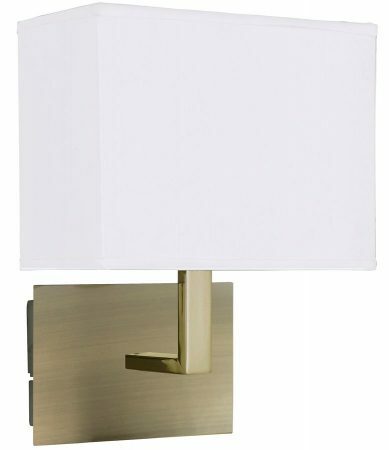 Featuring an oblong wall mount, right angled arm and lined white box shade for a classic look. Fitted with a handy rocker switch on the wall mount. A smart and substantial size wall light in soft antique brass that’s perfect for any stylish bedroom, dining room, hallway or living room wall. Also available finished in satin silver and polished chrome; please see below. This wall fitting is supplied by Searchlight who manufacture some of the best traditional and modern classic designs such as the switched wall light in antique brass finish with rectangular white fabric shade you see here.